Dumb Waiters are special microlifts designed for the transportation of food and drink in a sanitary manner. Dumb Waiters are ideal for use in a restaurant or hotel environment. Space requirements are minimal, making a microlift an useful feature, regardless of the size of the room. 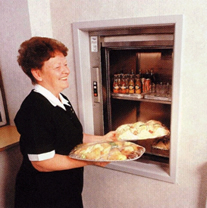 A Dumb Waiter makes it quick and easy to move foodstuffs between any number of floors, allowing for not only kitchen to restaurant transportation, but also kitchen to hotel room, or whatever your requirement may be.